If you are on the Google Chrome Stable channel you may have noticed that Google recently changed the new tab page in the web browser. The page now opens with the most visited sites and navigational elements on the right and bottom of the screen to switch to the web apps listing or bookmarks. The Internet and especially Google's Help forum is full of users who want their old new tab page back and disable the new one. There is a way currently to do that on the stable channel. Users on the Dev channel, which is Chrome 17 right now, cannot use that method anymore which indicates that it is only a temporary solution for the time being. The Google Chrome Properties menu pops up once you have selected properties from the context menu. Append --new-tab-page at the end of the Target path (leaving a blank inbetween) and save the changes with a click on OK. When you start Chrome again you should be able to work with the old new tab page again. But what if the flag is no longer working? 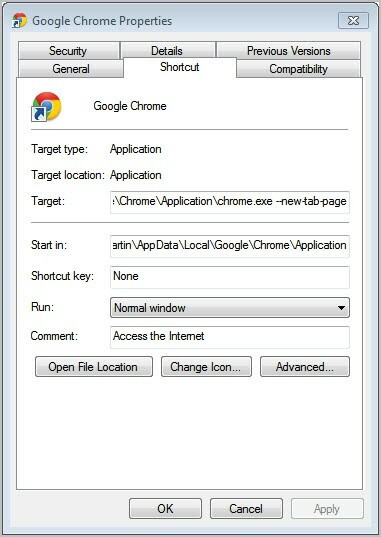 Your only option then is to install a third party extension to change the new tab page of the browser. You could install extensions like Define your own new tab to create your own tab page, New Tab Redirect to select a specific web address that is loaded when the new tab button is activated, Empty New Tab page for a blank page or Awesome New tab Page for a customizable tab page. What's your take on the new tab page in Chrome? Now, for those of you wondering if Martin reviews and offers tips for (Google) Chrome, well here you have it! I found the New Tab page more annoying than anything. I use the Speed Dial extension to override the behavior. configurable but it turned out to be not so. I don’t know why there’s many polemic with google chrome new page. I think now it’s more confortable since we can have tabs for recent visited pages and tabs for applications and a customised tab with our favourite web adresses. Well, I discovered this tip accidentally. So for everyone who like to have them own tab with them prefered shortcuts, it’s too easy now. You have just to drag a link (from recent opened or from bookmark tab) to the bottom of the page (New Tab Page), and automatically you’ll see a new tab added where you can drop your new shortcut. Well, it’s really a privacy issue. When I click the button that says delete “From the beginning of time” I really want to delete from the beginning of time, not from the beginning of time, as Google sees fit to tailor my user experience in a way that they feel is beneficial to me as a user. Long story shot: The application is lying to me. If they are saving enough data to determine my most popular pages, what else are they saving AGAINST MY EXPRESS WISHES and AGAINST THE STATED ACTION they claimed to execute. I agree with Dormir. Obviously there is a privacy issue here. That much should be apparent to anyone (even the arrogant morons at Google). This is the type of thing that would get me using another browser that didn’t arbitrarily make decisions like this one for you and then stuff it down your throat. Even the stupidest programmer should be able to see that an OPTION for the user is required. I also find the new tab page reallly annoying but at the same time I dont want to modify the codes… Google should turn it off by itself.